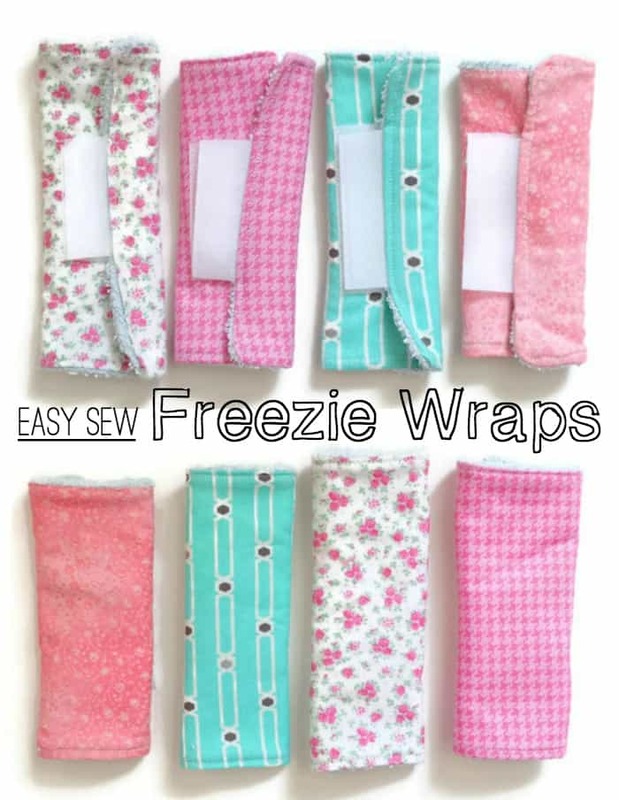 Freezie weather is fast approaching, and we’re armed with a fresh set of Easy Sew Freezie Koozies! Freezies are basically a main food group around here as the weather gets warmer, but no matter how high the mercury gets, little fingers still get a little nippy when Mr. Freeze is in town. Freezie Koozie to the rescue! I first made a set of these freezie koozies about 5 years ago, I’d have to say its probably the most useful thing I’ve ever sewed. I’ve even given them as summer party favours, and birthday gifts- they are always a hit, so I wanted to share how you can make some too! 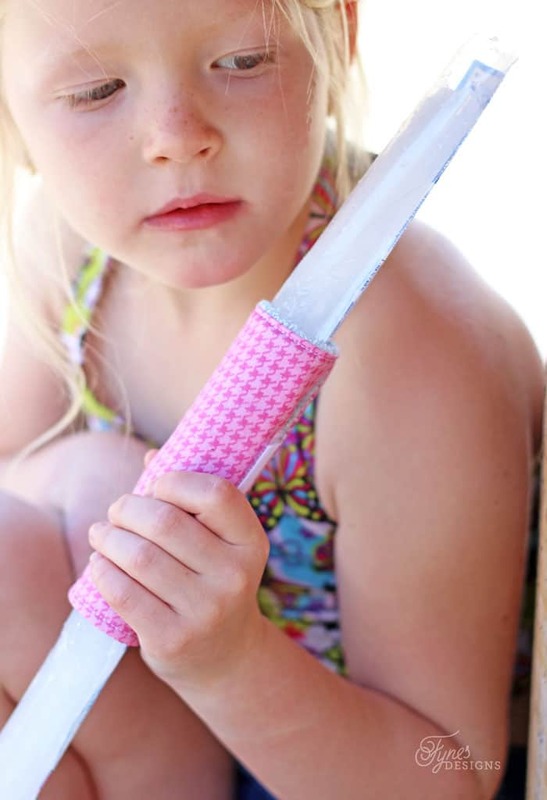 There are lots of options out there when it comes to keeping little fingers from freezing- neoprene, crochet patterns, old baby socks, even felt and fleece. 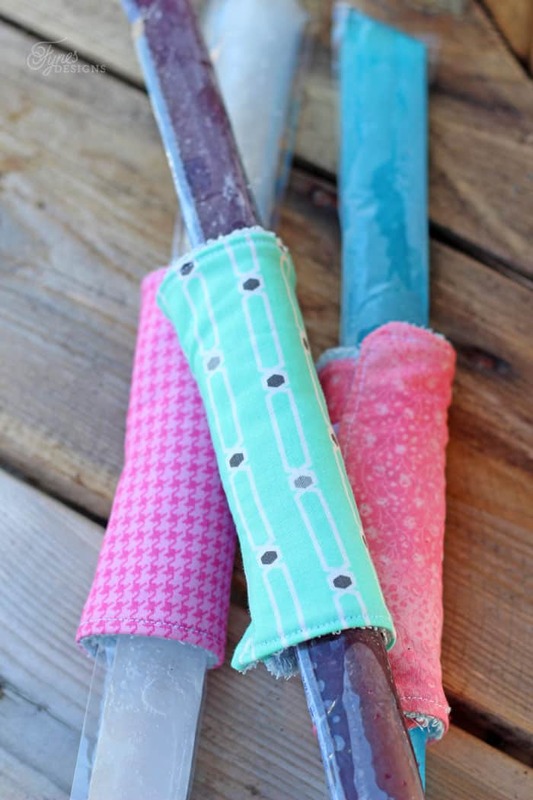 However, these freezie wraps are different because they are made with a washcloth (from the dollar store), not only do they keep fingers from frost bite, they also absorb water so there isn’t a drippy mess from the package. 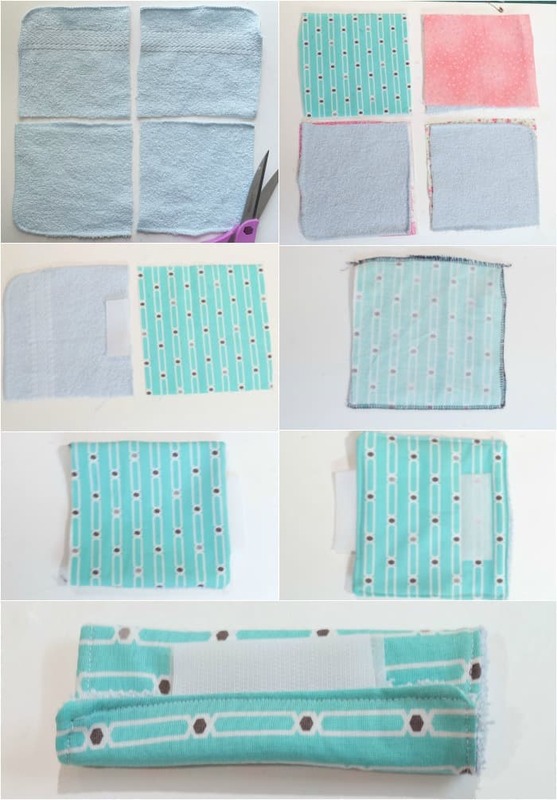 Cut the washcloth in half both ways, leaving 4 squares. Cut a piece of fabric to match each square. Line the male side of the 3″ velcro strip face down along the edge of the washcloth. Place wrong side of fabric and wash cloth together and zig zag or serge around 3 edges (1 being the size with the velcro). Fold open edge under and sew closed, top stitching around the parameter of the square. Sew the female piece of the velcro on the fabric side of the square- 1/2″ in from the outer edge opposite of the male velcro. You should be able to whip together a set of these koozies in about 10 minutes, your kiddos will thank you… I can’t lie, I use them too! The velcro makes them adjustable to any cool treat that might come your way. 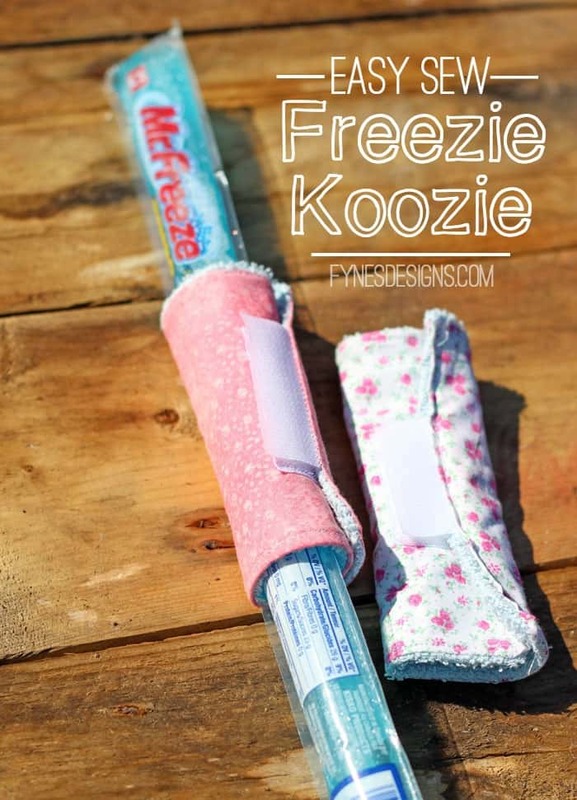 I promise, you won’t regret sewing up a handful of these Freezie Koozies, you’ll be summer snack ready! Awesome idea and great tutorial! I would love for you to link up to the Stitch It, Blog It, Share It Link Party going on now at BehindtheSeamsSewing.com. That is a fab idea! We would sometimes just grab a bit of kitchen roll but this is much better. I’d like to say my kids are now way to old for these, but actually I don’t think you are ever too old to want one of these on a hot day! This is a great idea and a great idea to do with scraps. Thanks for sharing. Just 3 straight lines, you won’t be disappointed, we use our all the time! I am so going to have to make some of these. So much better than a paper towel. What a clever idea! These would be great as a take home favor for a summer birthday party! These are so cute and such an original idea! My girls would love them! Genius! My kids are going to love these this summer! Such a brilliant idea! Thank you for sharing it at the #SmallVictoriesSundayLinkup! That is a GREAT idea! We always wrap small washcloths around ours because they are SO cold. Now, if only I could sew, I’d make these! Hi, Virginia! I just wanted to come by and let you know that we loved this post SO MUCH when you linked it up at the #HomeMattersParty that we’ve featured it THIS week! Would love for you to come by and check it out! 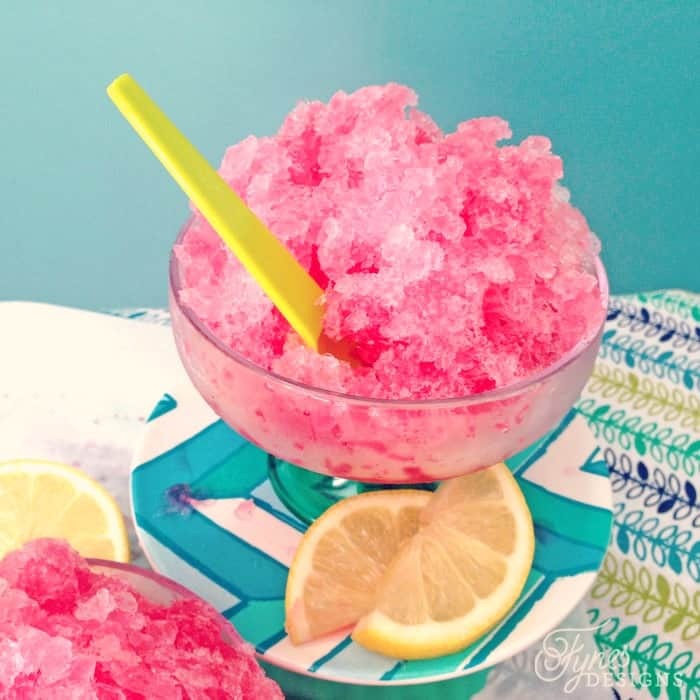 http://theroadtodomestication.com/2015/06/05/home-matters-linky-party-40/ Happy Friday!!! I seriously use them just as much as the kids! !